Pete Hamill’s The Christmas Kid is but one title in this collection of 36 short works of fiction. Don’t look for sentimentality or the aroma from bread baking in a long forgotten local bakery. Hard times and hard lives abound. This body of work was compiled from stories Hamill published, mostly in the New York Daily News. Many are set in post WWII Brooklyn neighborhoods near where Hamill has lived. With the exception of the title story, The Christmas Kid , these are sad tales about troubled lives in very tough neighborhoods. Street Gangs, lost loves, beleaguered drunks, revenge , missed opportunities and no way to break the cycle. Hamill often gives the reader a glint of optimism, then hope plummets off a cliff. Gripping, wonderful fiction for aficionados of New York lore . No one does it better than Hamill. Many of the stories could be the beginning of a novel unto themselves! The Christmas Kid was first published in 2012 and released in paperback this year. Who would place in the same context Teddy Roosevelt and William Howard Taft? 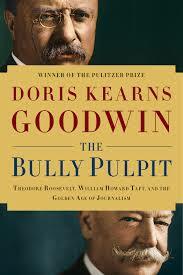 Doris Kearns Goodwin, just as she did with Lyndon Johnson and the American Dream, No Ordinary Time (FDR and Eleanor), Team of Rivals (Lincoln) has humanized Teddy Roosevelt and William Howard Taft in The Bully Pulpit, Theodore Roosevelt, William Howard Taft and the Golden Age of Journalism. It is remarkable that by comparing these two very different personalities, Goodwin has been able to create a finite understanding of the birth of the Progressive era in American politics. This extremely well researched work probes so deeply into the personalities of the two that the reader is left wondering who might have been the better to successfully carry out the reforms of the Progressive Movement, TR or Taft! The book captures the two friends joined at the hip, partners in a mission of reform, and then torn apart by TR’s un-checked ” Bull Moose” ambition; finally coming together again after self-imposed mutual defeat. It reminds me of the deathbed reconciliation of Thomas Jefferson and John Adams so emotionally detailed in David McCulloch’s, John Adams. The Bully Pulpit is four books in one! The reader is served up two great biographies, one of Theodore Roosevelt, the other of William Howard Taft. The other two Goodwin gifts are an understanding of the birth of the Progressive Movement in America and not by any means in descending order, the advent of investigative and advocacy journalism, Muckraking, in American politics. The Bully Pulpit establishes the critical role played by the press in determining public policy at the turn of the 20th Century. The term Muckraker has a new meaning in Goodwin’s book and the role of S.S. McClure’s McClure’s magazine in promoting progressivism is a book unto itself. Great books stimulate and The Bully Pulpit, while is has the greatest emphasis on Teddy Roosevelt, raises dramatically the profile of President Taft and his wife Nellie. Taft defies a Progressive, Liberal or Conservative label. He could not be easily categorized in the 21st Century political vernacular. His wife Nellie, unlike Edith Roosevelt, played a large role in Taft’s decisions which was prescient indeed for the relationship that followed between his successor Woodrow Wilson and his wife, Edith. One of the reasons that The Bully Pulpit is so compelling is that the philosophies, conflicts and important social issues of the time could just as well have been written about the beginning of this century. With that perspective, in the spirit of Ray Baker’s ” why bother with fiction,” there is more grist for the mill for historians and Muckrakers to ponder in today’s America. Note: For lovers of history one good read prompts another. I will seek out the biography William Howard Taft by Louis Gould and one of Sam McClure, The Muckrakers by John Simkin.